The Koermann Block will soon be re-built into the facade of the coming Artists’ Quarters. Led by Arts Habitat and Artists’ Urban Village, the new development will provide live/work space for artists of all artistic disciplines. 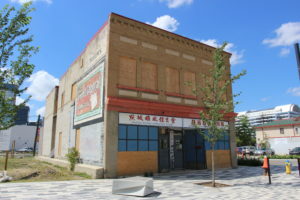 The storefront level to third floor will host nonprofit arts organizations such as the Alberta Craft Council, Mile Zero Dance, and Rapid Fire Theatre. Edmontonians have known the Koermann Block as the Ukrainian Bookstore since 1918. As such an important Edmonton landmark, the Block and Bookstore was recreated at Fort Edmonton Park. The building was originally built in 1911 by Gustave Koermann, whose German-language newspaper Alberta Herold was doing so well that he and his wife could construct their new brick building on Kinistino Ave. (96 St.) with commercial tenants at the back, residential above, and a printing business up front. Canadian immigration agents in the mid-1890s had advertised “… free land, where a man might become rich overnight… a land of temperate climate …sod just waiting to be turned”, and German-speaking immigrants came from Germany, Russia, Romania, Austria, and Switzerland. Before WWI, these settlers’ businesses and political careers flourished. But when WWI broke out Koermann, like other German-Albertans, was classified as an “enemy alien” and his assets seized.